After rumors that He Nan is either closing or moving (hopefully moving), we couldn't risk not trying the spicy big tray of chicken. 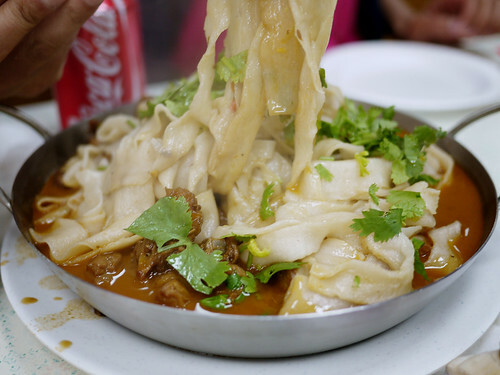 Based on Bionic Bites's recommendations, we skipped the soup dumplings, went straight for the chicken with hand pulled noodles and a fantastic $2 pork pancake. With the addition of a cold cucumber salad, it was just about a perfect meal to share with a sister just arrived in town from Berlin. We ate and ate and ate, the spiciness not as fire-spicy as Xi'an, but in a way nicer because it could be enjoyed without sweating. And still we had enough chicken leftover for dinner.